Have you ever had trifle? It’s a layered English dessert, made out of custard, fruit, sponge cake, gelatin, and whipped cream. It’s nothing fancy, really, just some tried-and-true ingredients all put together, but the outcome is light, frothy, and absolutely delicious. Such a thing is the movie Miss Pettigrew Lives for Day. Take an outstanding cast, add a straightforward (but familiar and always reliable) story; layer carefully, and what you end up with is quite the tasty little treat indeed. The story itself should come as no surprise to anyone. When confronted with the glamorous but shallow lifestyle of Delysia and her friends, the sensible and provincial Miss Pettigrew is dazzled but not convinced. She knows perfectly well the life that Delysia should choose, and the man with whom she should choose to spend it. She also knows that Edythe’s dishonesty will not go unpunished. It’s no major spoiler to point out that the plotlines progress just as they are supposed to in such a story. Those good, solid, English virtues win out over the glitzy lifestyle of fame and fortune, and there’s even a happy ending in store for our heroine. It’s a story we all know by heart, but that doesn’t make it any less enjoyable. The reason that it works so well here is the cast. Did you notice those names? Frances McDormand is, of course, never less than fabulous, and I am personally not an Amy Adams fan, but she’s completely effective here. Her trio of leading men, too, are fully capable of embracing their roles, but the stand-out is Mr. Pace. It clearly takes someone special to make Miss Pettigrew swoon, and we swoon right along with her. Shirley Henderson, with her sharp eyes and oddly youthful face and voice makes for an excellent villainness, and I just don’t know what to tell you about Ciaran Hinds except that he is outstanding in a cast of outstanding actors. In a time where leading men seem to be getting younger and younger, give me the sadder but wiser chap any day. His Joe is suave, handsome and worldly, but he didn’t come from the glamorous life, and he and has few illusions about the role that he occupies within that world. In all, I wasn’t really expecting that much from this movie, but I was quite pleasantly surprised. It’s witty, fun to look at, and surprisingly poignant. It’s not doing anything new, but sometimes hearing a familiar tale told particularly well is even more enjoyable than something new and ground-breaking. Strongly recommended for fans of any of these actors, particularly Mr. Hinds and Mr. Pace. I don’t think you’ll be disappointed. I LOVE this movie… it’s a cute little movie. I’m a big fan of Hinds and Pace, and yes they did not disappoint. 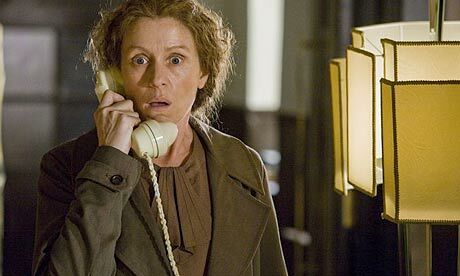 I also enjoyed Frances McDormand as the title character. Shirley Henderson generally creeps me out but it works in this case. Yeah, I totally enjoyed it. Thought it would just be something silly, but then it was really good!